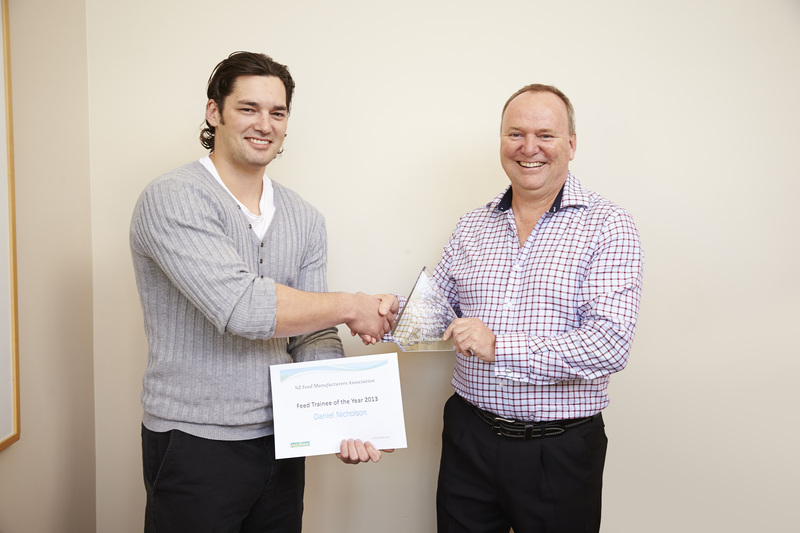 Pic: Dan Nicholson (left) receives his award for NZFMA Feed Trainee of the Year from Wharehoe Lissington, National Feed Mill Manager, Tegel Foods Ltd.
New Plymouth-based Tegel Foods Ltd employee Dan Nicholson is delighted after picking up the inaugural 2013 Feed Trainee of the Year Award. The prestigious award, which will be given annually by the New Zealand Feed Manufacturers Association (NZFMA) , recognises the trainee achieving the highest overall marks in the Association’s industry training programme. “The introduction of the award in conjunction with our recently developed training courses reflects the NZFMA’s commitment to creating a highly skilled and knowledgeable workforce,” says NZFMA Executive Director, Michael Brooks. 30-year-old Dan is a ten-year veteran of the industry, having started as a bagging operator and then a press operator at NRM’s feed mill in Levin where he worked for four years. In 2008 he relocated to New Plymouth for a lifestyle change and joined Tegel’s New Plymouth feed mill. He has since worked his way through a variety of roles to the position of Senior Operator. Although he was “a bit gobsmacked” to win the award, Dan says the hard work involved in the training course was very valuable in giving him greater industry knowledge. As part of his award, Dan was flown to Christchurch last month for a presentation ceremony at the NZFMA’s Annual General Meeting, and attended a dinner with senior feed industry executives. The NZFMA’s industry training programme was developed in association with Competenz and the Australian College of Training. Study for the 12-month course, which leads to the New Zealand Certificate of Stock Feed Manufacturing, involves a combination of theory units, workplace assessments and two two-day workshop courses.